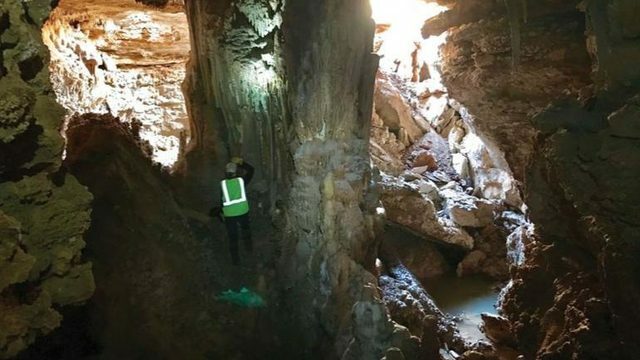 WILLIAMSON COUNTY, Texas - Texas environmental consultants were busy exploring a 170-foot long cave that was found after a portion of a residential street in a Williamson County neighborhood north of Austin collapsed earlier in the week. The cave stretches eastward from the site of a sinkhole, located in a neighborhood in the Brushy Creek area. The height at some points of the cave reaches 22 feet, with an average height of 10 to 15 feet, according to a county news release. The county said structural engineers will explore the site to help determine the cave’s stability. They’ll also decide how to repair the sinkhole, which could take several weeks as the assessments and repairs take place. The Brushy Creek area and Cedar Park are hosts to several caves, including a cave near the Brushy Creek greenbelt that is home to bats.